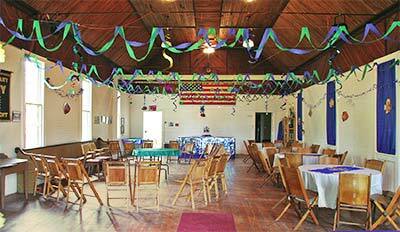 Harmony Hall is suitable for meetings, lectures, luncheons/dinners, parties, dances, music, small theater productions, etc. It can hold up to about 150 people depending on furniture arrangements. There is a kitchen suitable for light preparations. There are 2 restrooms. We have a stage in 2 moveable sections of 4x8ft, chairs for about 80 people, and several round tables suitable for dining. To discuss specific arrangements or to see the facilities please contact John Ripley or Lita Eskin, president HCC.